The process may vary slightly depending on your operating system and browser. Tablets such as iPad or Android will not download compressed files without a third party app. We recommend downloading and unzipping the videos to your computer, then copying them to your tablet. You will receive an email with a download link. Click on the link. A browser window will open. 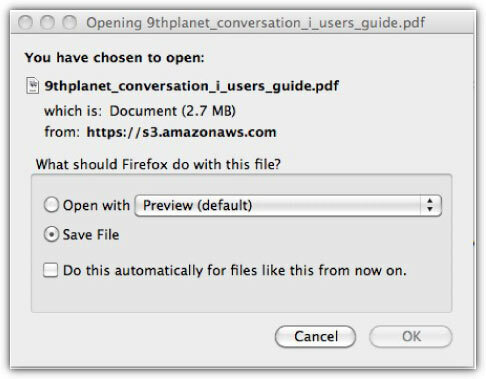 A window will open with the choice to “Open” or “Save.” Choose “Save File” and the files will be saved in your Downloads folder. This may take a while depending on your internet connection. On some systems a window will not appear and the files will be saved automatically. Repeat with each of the files on the page. The video files are compressed (zipped) for faster download. Before you can watch the videos, you will need to unzip the compressed files. On a Mac, double-click on the file. Archive Utility will launch automatically and unzip the file.